On CNN's State of the Union Sunday morning, President Trump's senior policy adviser, Stephen Miller, engaged in a tense, 12-minute interview with host Jake Tapper in which he tried to defend his boss' comments on Twitter about being a "very stable genius" and "like, really smart." But it appears Miller's on-air anger wasn't just for show. A CNN source has confirmed a report by Business Insider's Linette Lopez that Miller had to be escorted off the set after the interview. According to the source, Miller was politely asked to leave the set multiple times, but refused. Eventually, security was called and escorted the agitated Miller off Tapper's set. Neither CNN nor the White House immediately responded to request for comment. Miller was dispatched to CNN amid the fallout over Michael Wolff's best-selling new book, Fire and Fury: Inside the Trump White House. The juicy, high-in-demand book quotes former Trump strategist Steve Bannon calling a 2016 campaign meeting at Trump Tower between three top campaign officials — Paul Manafort, Jared Kushner and Donald Trump Jr. — and a Russian lawyer with ties to the Kremlin "treasonous" and "unpatriotic." Bannon also suggested to Wolff that Trump himself met with the Russian lawyer, Natalia Veselnitskaya, after she met with the top campaign aides. Miller sidestepped repeated questions from Tapper on whether that claim was true. "I have no knowledge of anything to do with that meeting," said Miller, who was a senior policy adviser on Trump's campaign at the time the meeting took place. Trump has repeatedly denied claims he was aware that his eldest son, as well as his son-in-law, had met with the Russians at Trump Tower. Despite suggestions on Fox News that CNN attempted to silence Miller, the top Trump staffer was given more than 12 minutes to defend the president. He repeatedly praised Trump as a "political genius" and bashed Bannon's quotes as "grotesque" and "vindictive." Miller also refused to answer most of Tapper's questions, leading the host to suggest Miller's comments were aimed at one individual — Trump himself. "There is one viewer that you care about right now," Tapper said. "And you're being obsequious, you're being a factotum, in order to please him." 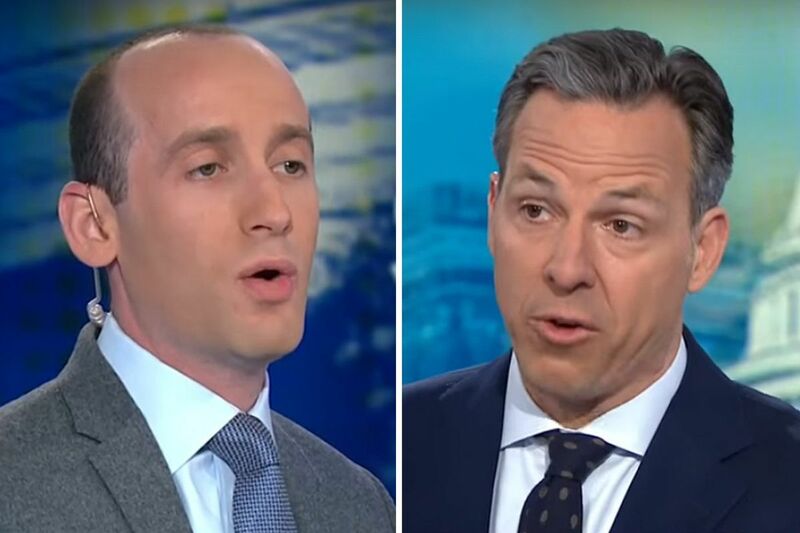 Miller's refusal to answer Tapper's questions led the host to wrap up the segment early, over Miller's objections, while saying, "I think I have wasted enough of my viewers' time." Despite declaring last February that "I don't watch CNN," Trump himself appeared to confirm Tapper's suspicions about an hour later, when he blasted the CNN host on Twitter as a "flunky." "Jake Tapper of Fake News CNN just got destroyed in his interview with Stephen Miller of the Trump Administration," Trump wrote on Twitter Sunday morning. "Watch the hatred and unfairness of this CNN flunky!" Trump said in November that he doesn't have time to watch TV "primarily because of documents," but according to a new report by Axios' Jonathan Swan, the president has pushed back the start of his workday to 11 a.m. to accommodate more "Executive Time," which includes watching TV and posting on Twitter in his official residence. "The time in the morning is a mix of residence time and Oval Office time, but he always has calls with staff, Hill members, Cabinet members and foreign leaders during this time," White House press secretary Sarah Huckabee Sanders wrote in response to the Axios story. "The president is one of the hardest workers I've ever seen, and puts in long hours and long days nearly every day of the week all year long. It has been noted by reporters many times that they wish he would slow down because they sometimes have trouble keeping up with him."